The MOVAX Control System MCS Pro+auto is an advanced, state-of-the-art control system for easier, precise and more productive and efficient operation. 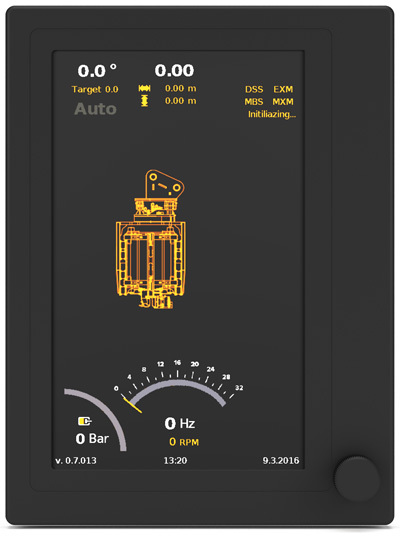 The visual user interface of the MCS Pro+auto is based on a 7″ display with easy-to-read graphical symbols for the position, vibro frequency or piling hammer impact energy rate, and hydraulic pressure. User-friendly menus for calibrating and optimising the performance of both the Movax equipment and the excavator hydraulics. The MCS Pro+auto provides full system diagnostics directly on the screen and can be set to remind the operator of critical maintenance tasks, such as changing oil and oil filter. The control grips with proportional rollers are ergonomically shaped and designed for simultaneous control of multiple operations. The grips have a large number of switches and rollers to accommodate non-MOVAX functions as well. The MCS Pro+auto control feature makes the excavator mounted MOVAX side grip pile drivers and piling hammers travel in a straight line by taking over a demanding part of the boom control. The system is based on angle sensors on the excavator and the MOVAX piling equipment and proportional pilot valves mounted on the excavator. The smart user interface allows the operator to switch the automatic control on or off at any time while keeping his/her hands on the controls at all times. MCS Pro+auto can be upgraded to meet different needs. Versatile connectivity makes it possible to add pressure sensors, a boom-mounted camera or a wireless site camera for top-level safety, productivity and accuracy.